Such a discouraging day. Every piece had sharp edges and was quite small. About 5 total. Have had casts on my legs on and off for 3 years so really was hoping for an uplifting day in the sun. These beaches were small enough for even me to walk, I have about 15 min before I can’t, but nothing was found worth keeping. “Pro” beachcombers seem very protective of their spots but then you read they’ve amassed thousands of pounds of seaglass, some of us who have to drive 2 hrs+ to the coast would be happy with a handful. I have been to Tochester Beach many times. 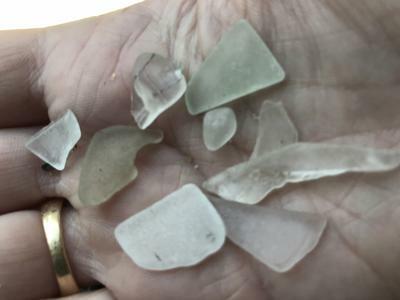 It is one of my favorite places however, professional sea glass searchers live very near there and I have found they are VERY territorial about it. I agree with you, a small handful would be nice! One thing I learned is that Tolchester used to have a long pier that went out over the bay and people would throw trash off the pier. That is why you can find nice pieces there if you get there when the pro's are not! An FYI, Richard LaMotte who wrote the book on Sea Glass lives in Chesterton, Beach not far from there. I have not met him on the shoreline yet. He is a nice man and doesn't piddle over small pieces. I think he sails by sailboat to a private island place he has found in the Bay. Betterton is disappointing for glass but wonderful for driftwood especially small pieces. I like to use them in crafts along with my sea glass. Hi Amy - Sorry you did not have a good day. I see you live in Southeastern PA - have you tried any beaches in DE? There are some places that have nice glass such as Woodland Beach. Not the easiest place to get to - but if the tide is out - it can be quite good. Hope you have better luck next time. Happy Hunting!